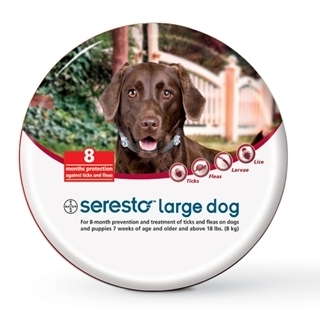 Bayer Seresto Large Dog Flea and Tick Collar eliminates the need for monthly topicals by continuously protecting your dog against fleas and ticks for up to eight months. This water resistant collar features a quick release mechanism for safety. For use on large dogs and puppies 7 weeks and older and over 18 lbs. 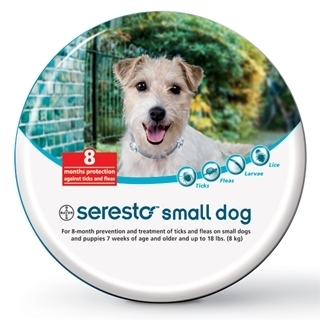 Bayer Seresto Small Dog Flea and Tick Collar eliminates the need for monthly topicals by continuously protecting your dog against fleas and ticks for up to eight months. This water resistant collar features a quick release mechanism for safety. For use on small dogs and puppies 7 weeks and older and up to 18 lbs. 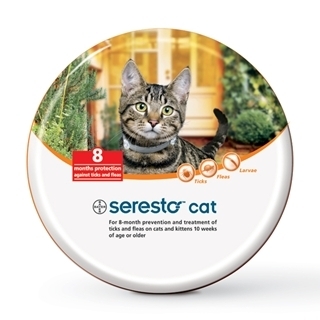 Seresto Flea & Tick Collar for Cats 10 Weeks and Older eliminates the need for monthly topicals by continuously protecting your cat against fleas and ticks for up to eight months. The Seresto Flea & Tick Collar is water resistant and features a quick release mechanism for safety. For use on cats and kittens 10 weeks of age and older.